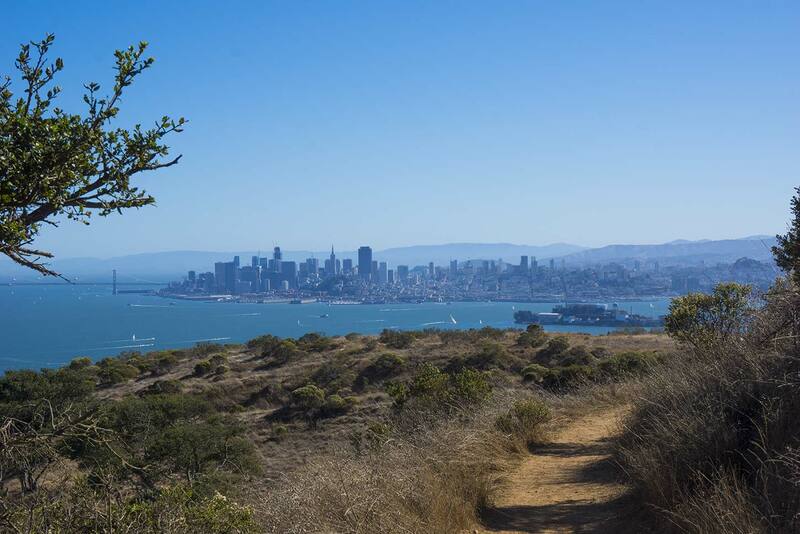 Thanks to its location in the middle of San Francisco Bay, Angel Island has by far the best scenic views of any park in the Bay Area. 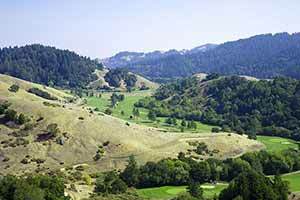 The Mount Livermore hike is the best way to see these views. 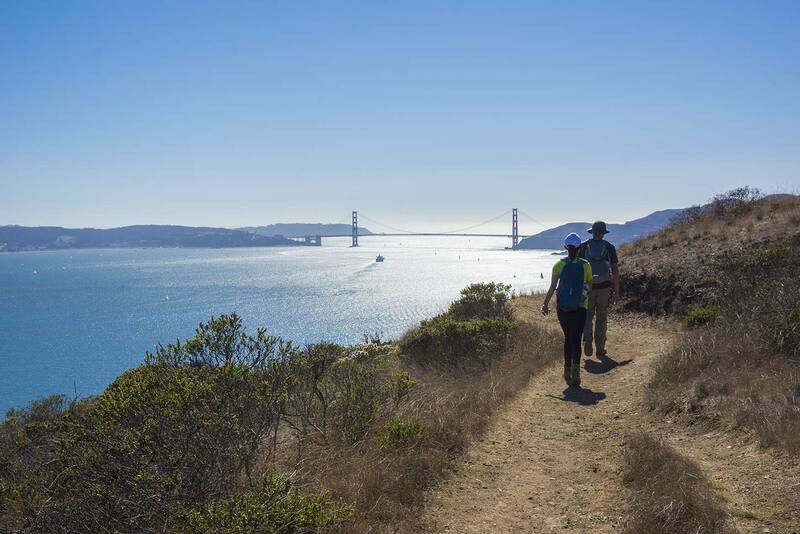 What makes this hike especially engaging is the way the views gradually open up as the trail winds its way around the island: first there are views of Ayala Cove, then the narrow Raccoon Strait, then of the bigger expanse of water between Angel Island and San Francisco, and finally views of the entire bay to the east. The only way to get to the island is by ferry or water taxi. 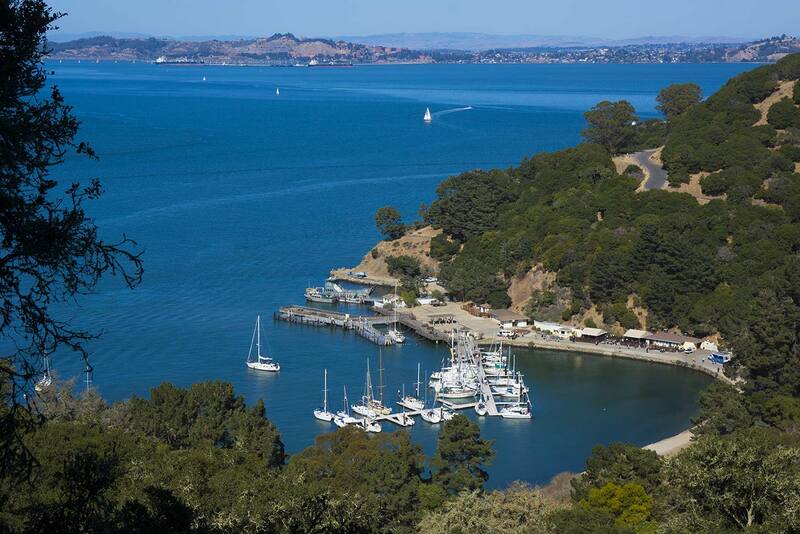 Ferries leave from Tiburon every hour between 10 am and 5 pm in summer. 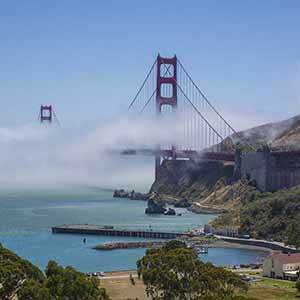 There’s also ferry service from San Francisco, but there are fewer departures and the round-trip ride is about an hour longer. 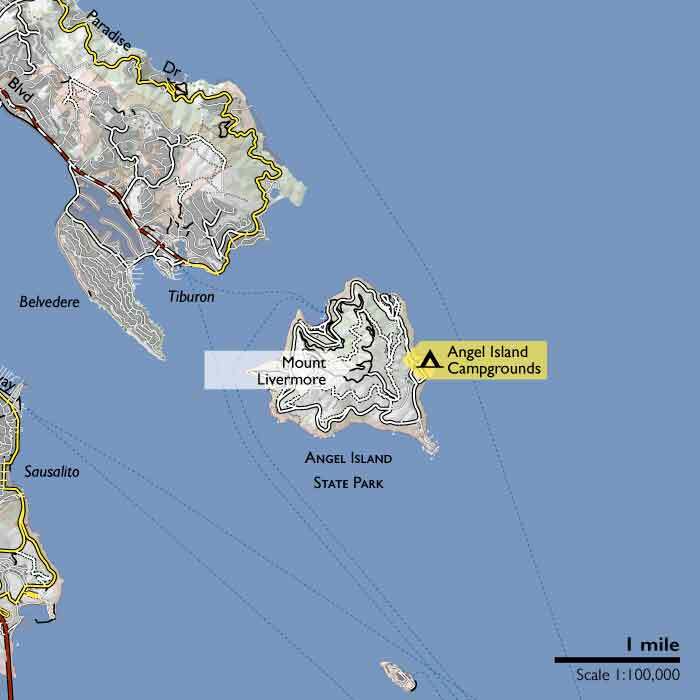 Either way, the ride to the lushly-wooded north side of the island is one of the scenic highlights of a visit to Angel Island. 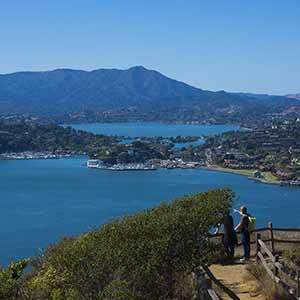 Many visitors to the island just hike an out-and-back on the North Ridge Trail, which is the most direct route to the peak; this is a mistake since most of the really good views are on the longer Sunset Trail. 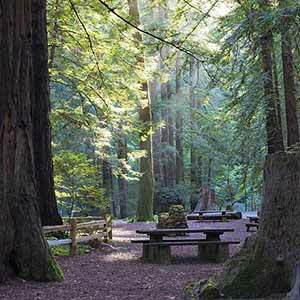 The hike takes about two hours at a brisk pace; allow at least three to be safe. The entire loop is quite popular and on a nice weekend you’ll see a group of hikers about every 2 or 3 minutes. Here’s the Tiburon ferry location and the San Francisco ferry location in Google Maps. From the ferry dock, follow the paved road through the busy Ayala Cove area. The road passes a marina, rental stands and snack bar, then the popular beach and the visitors center, which is in a historic and slightly shabby-looking house. Follow the road as it climbs out of the cove area. At a T intersection with the perimeter road, look for the singletrack trail slightly to your left. 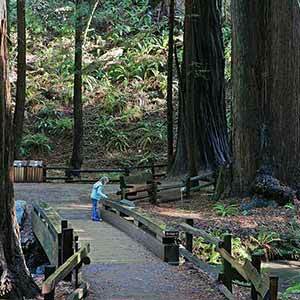 The trail climbs through attractive oak woods that are typical of the peninsula. Crowd noise and music from Ayala Cove drift up to the trail for quite a while as it gradually switchbacks up the hill. 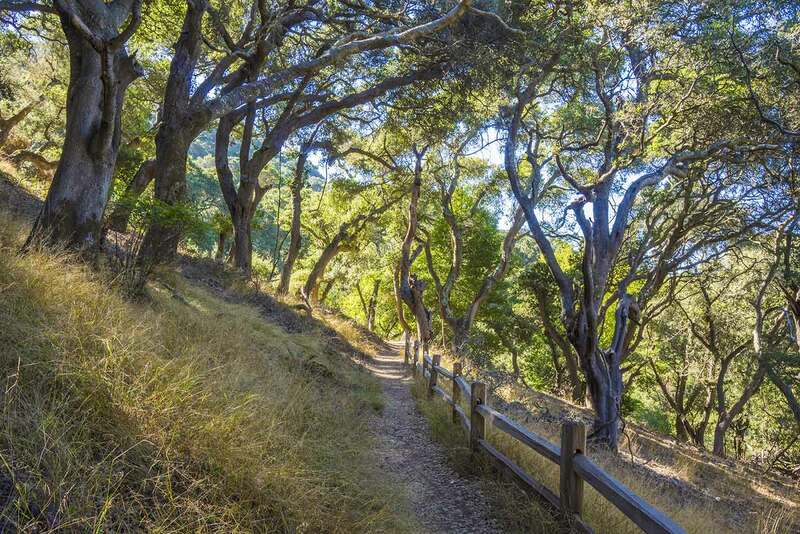 There are a few views of Ayala Cove through the trees, then the trail rounds a corner, the noise falls away, and there’s a nice view of the wooded Tiburon Peninsula and the Marin Headlands. 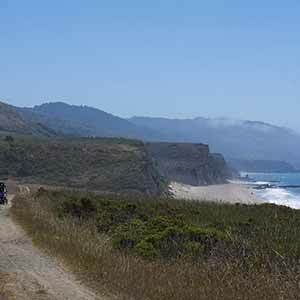 As the trail climbs and gradually winds its way around the island, the oak forest gives way to open scrub and the views open up dramatically. 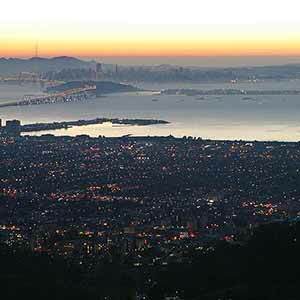 The Golden Gate Bridge, then the city of San Francisco come into view. 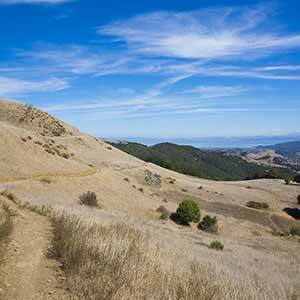 As the trail levels out the East Bay comes into view. 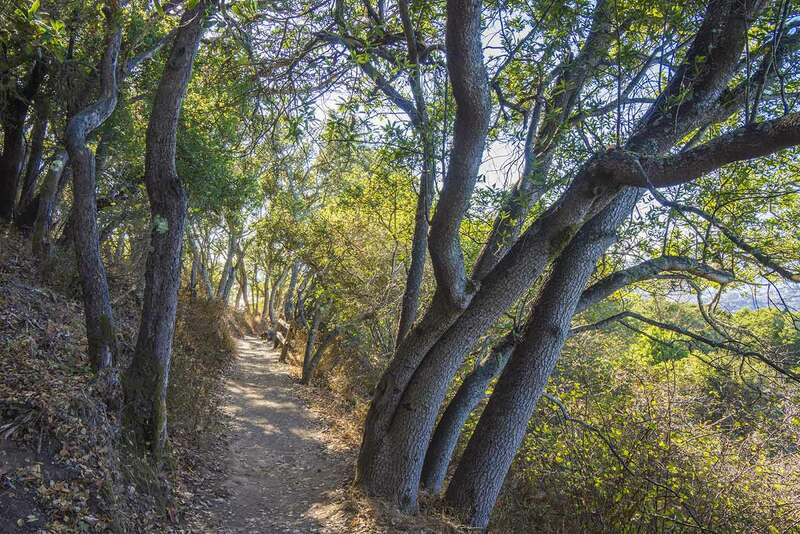 A short spur trail climbs through oak woods to the peak. The peak itself has a 360 degree view; there’s a small clearing at the top with a little antenna. 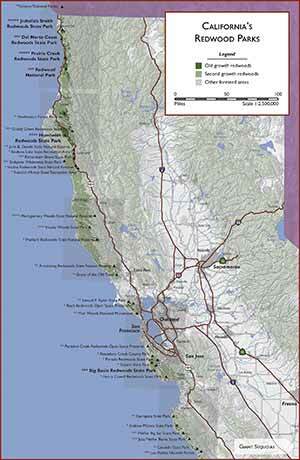 Take the North Ridge Trail back to Ayala Cove. There are a lot fewer scenic views on the way down. As the trail descends, the woods get progressively lusher, culminating in a dark ravine covered with bay laurel.